Canola and sunflower oils 74%, water, modified palm and palm kernel oils 6%, salt, buttermilk powder 1% (milk), natural flavours, lactic acid, vitamin a palmitate (vitamin a), vitamin d3, natural colour, soy lecithin. 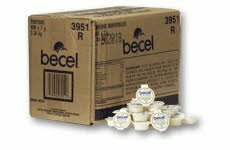 Becel is the #1 doctor and dietitian recommended brand of margarine. It is non-hydrogenated, low in saturated fat, and cholesterol free. Becel is also a source of essential fatty acids such as omega-3.